Though the City’s “Full Stop Work Order” remained in effect for only a few days, it gave what’s left of this historic building a respite from the bulldozer. 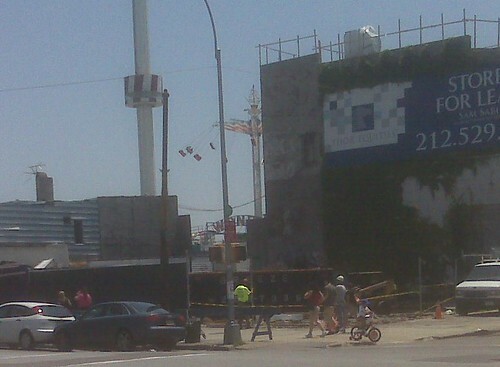 And it was immensely satisfying to be able to write a headline that began “DOB Stops Thor Demo of Coney Island…. “ while the Stop Work Order was in effect. The City has of course failed to stop Thor Equities from first blighting and now demolishing historic buildings in Coney Island. 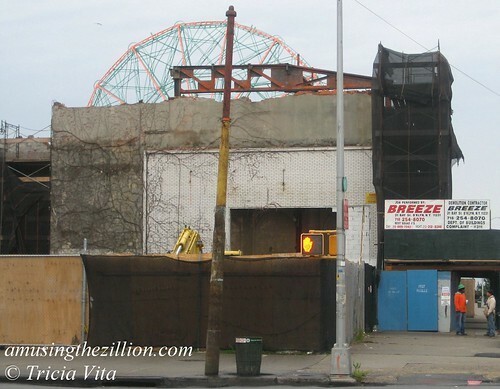 July 1, 2010: Thor’s Coney Island: Demolition Under the Radar? ATZ has postponed our funeral service for the Bank of Coney Island, which was expected to be completely demolished in two weeks. The partially demolished building is still doomed, but on Wednesday it got a respite from the bulldozer. The Department of Building’s BEST Squad –the Building Enforcement Safety Team– issued a “Full Stop Work Order” at the bank because debris was falling onto adjacent buildings. Our source said a wall coming down is shared with an adjacent property owner who according to city regulations must pay to build a new wall before work can proceed. There’s talk of a court order to force compliance. Who knows how long this will drag on? The demolition permit, which was originally issued in August, was re-issued in October and remains valid through June 11, 2011. These documentary photos are from a set shot inside the bank on Sunday by photo blogger Single Linds Reflex. 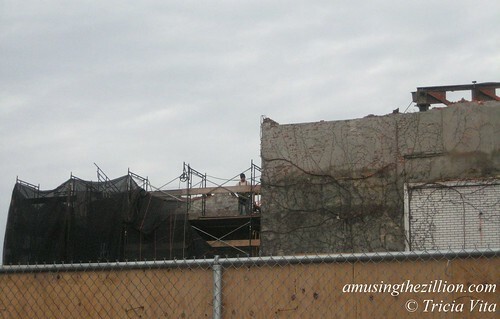 Alas, Thor’s demo crew resumed work at the doomed Bank of Coney Island again on Monday. 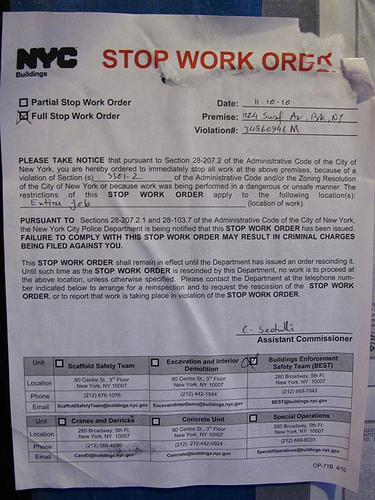 The DOB rescinded the stop work order, noting that the required fencing was now in place. Though the Stop Work Order remained in effect for only a few days, it was immensely satisfying to read the headline “DOB Stops Thor Demo….” while it lasted, wasn’t it? Funeral arrangements are being planned. In lieu of flowers contributions may be sent to the National Trust for Historic Preservation. Thor’s Coney Island: Demolition Under the Radar? In New York City, especially in Thor’s Coney Island, if you see a building being demolished without a posted permit, say something. Call 311 right away. Don’t dawdle. There appears to be a loophole in the law that allows property owners to get away with demolishing structures whether or not they have a permit, as long as the DOB doesn’t actually catch anyone in the act of demolition. At least that’s what appears to have happened at Thor Equities-owned property at 1124 Surf Avenue and 12th Street in Coney Island on June 18. “NO VIOLATION WARRANTED FOR COMPLAINT AT TIME OF INSPECTION. NO DEMOLITION WORK NOTED AT TIME OF INSPECTION, NO WORK NOTED,” wrote Badge #2425 in his report. What about the fact the buildings were there on June 17? Show us the permit, please. On Friday, June 18th, around 1 pm, ATZ learned of the demolition of Thor Equities-owned buildings at the corner of Surf and 12th Street, which took place in the early morning hours. 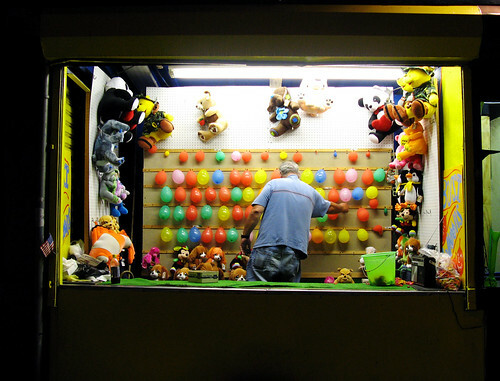 By the time a tipster arrived on the scene and sent us the above photo, the former balloon dart game, Pina Colada stand and tattoo parlor were in the dumpster. The DOB inspector turned up later in response to a Coney Island resident’s complaint. But the inspector, who said he was not allowed to give his name, told a bystander that he had to catch them in the act of demolition to issue a violation. The report which is now online on the DOB website corroborates this point. The demolition was carried out by crews working the graveyard shift at a time when everyone else in Coney Island was getting ready for the big weekend–the first Friday Night Fireworks, Mermaid Parade, Brooklyn Cyclones season opener. A fence went up to secure Thor’s property. Now it’s an empty lot to add to Thor’s collection of empty lots. On the Coney Island Message Board, Capt Nemo called it “Sitt-struction begins, there yesterday gone today” and posted before and after photos. Some of you may look at the photos and agree with the poster on the CIUSA board thread who wrote sarcastically, “Maybe that gorgeous structure should have been landmarked. It looked like a dump I always thought. Looks better as a lot frankly, c’mon seriously?” Our response would be you’re missing the point. Letting a property owner get away with demolishing a structure without a permit sets a bad precedent. What’s next on Thor’s hit list? 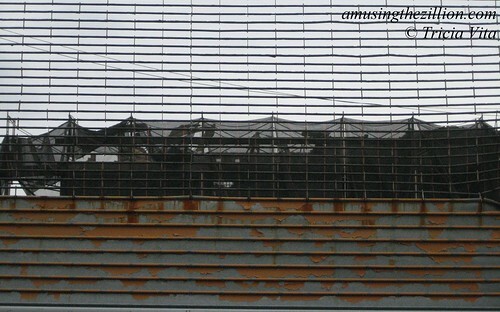 The doomed Bank of Coney Island adjacent to the newly empty lot, where pre-demolition asbestos abatement is in progress? In fact the early morning demolition of the concession stands reminds us of Rudy Giuliani’s early morning bulldozing of Horace Bullard’s Thunderbolt roller coaster in 2000, which ended up in court. No one has suggested these concession stands should be landmarked. 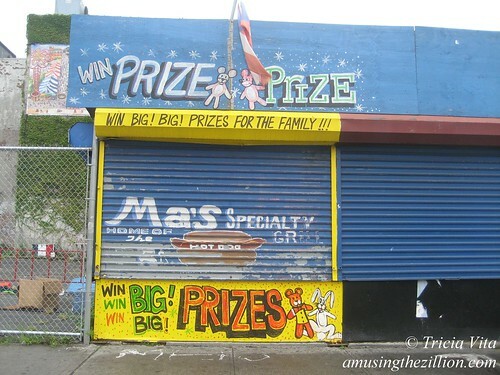 We’re sad to see another vestige of Coney Island’s vernacular signage and old school carnival games bite the dust. As someone who grew up working behind the counter of our family’s carnival games, we see a stand that was a fellow concessionaire’s business. Today he is driving a cab. One of our favorite photos of his vanished balloon dart is titled “goodbye astroland” (posted above) because the photographer shot it on Astroland’s last day in 2008. 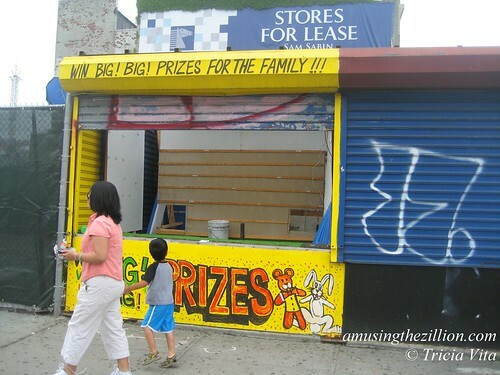 But for the operator of this game and other individual operators in Coney Island evicted by Thor Equities, a more apt title would be “Goodbye Amusement Business.” While Coney Island’s revitalized amusement area is booming, Thor Equities property is kept vacant. Last July, the Surf Avenue site owned by Thor Equities was rezoned for a 30-story hotel. April 29, 2010: Thor’s Coney Island: Joey “Bulldozer” Sitt Is Baaack Playing Games!